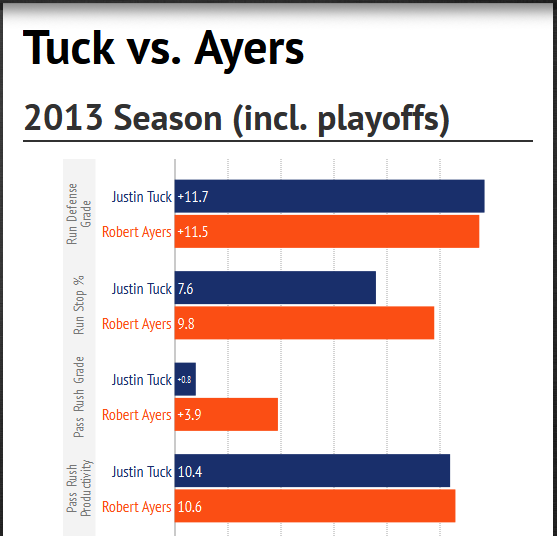 Home » Giants roster 2014: What’s the difference between Justin Tuck and Robert Ayers? 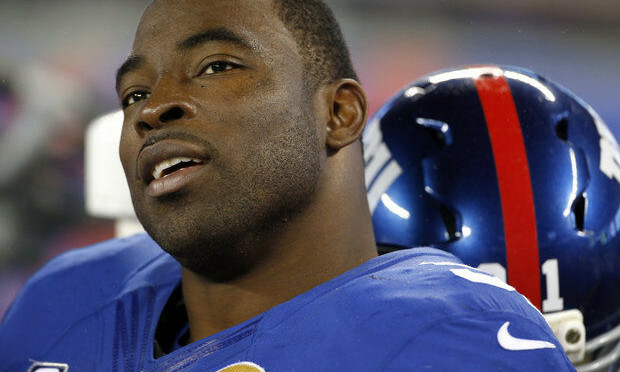 Giants roster 2014: What’s the difference between Justin Tuck and Robert Ayers? The Giants lost one of their most stable leaders this offseason when Justin Tuck signed a two-year, $11 million deal with the Oakland Raiders. Make no mistake: Tuck wanted to return to New Jersey. He would have taken less money to do so, but both sides were still far apart when it came to perception of value. And while the team will hunt for his long-term replacement in the draft, they picked up former Broncos defensive end Robert Ayers on a two-year deal worth roughly $4 million ($1.75 guaranteed) in the meantime. So, how did they do? How close, production wise, did the Giants come to replacing one of their best defensive players of the last decade? Tuck: Played in 3,236 snaps since the start of the 2010 season. Ayers: Played in 2,382 snaps since the start of the 2010 season. * Think about that for a second; Ayers is three years younger than Justin Tuck and, even in the past four seasons, has played 854 fewer snaps. Some will call this a disadvantage -- Tuck has "evolved" as a pass rusher during this time. Experience allows him to play offensive lineman differently and rely less on physical skill. But in today's NFL, mileage is a significant factor. Ayers has the youth and the preservation. He's never played more than 661 snaps in a year (2013 was a career high). Tuck Played almost 900 snaps in 2013, and more than 800 in each of the past four seasons. Tuck: Ranked No. 7 overall among 4-3 defensive ends in football by Pro Football Focus, No. 17 in pass rushing effectiveness and No. 8 in play against the run. Tuck finished the season with 44 quarterback hurries, 12 quarterback hits and 11 sacks. Ayers: Ranked No. 14 overall among 4-3 defensive ends in football by Pro Football Focus, No. 18 in pass rushing effectiveness and No. 9 in play against the run. Ayers finished the season with 31 hurries, seven quarterback hits and 5 1/2 sacks. This is tougher to quantify. As we've written in the past, the Giants have some concerns about the development of Jason Pierre-Paul and, to a lesser extent, Damontre Moore. Tuck was the glue that held the room together. He was quick to rattle off a text or say something if he was worried. He had a strong voice in the meeting room, and knew the institutional layout better than anyone. That being said, the landscape is changing in East Rutherford. Could Ayers, a former first-round pick coming off a Super Bowl appearance, fill that void?